Yoga Connects is a unique parent-child yoga program designed to meet the needs of young people with autism and other special challenges. Parents participate side-by side with their children, sharing the experience of yoga together. Yoga Connects utilizes a visual yoga curriculum and specialized teaching approach developed by Hannah Gould, M.Ed., RYT. 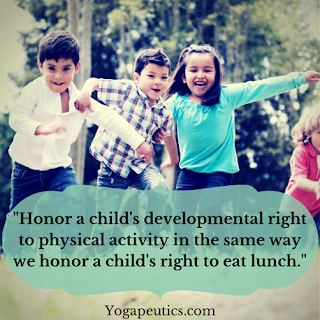 In September, 2014, a research article published in "Pediatrics" scientifically confirmed such wisdom as applied to a child’s developing brain. This study uniquely demonstrated that children who move their bodies extensively and frequently are better at paying attention and have better abilities for impulse control, decision making, and problem solving. 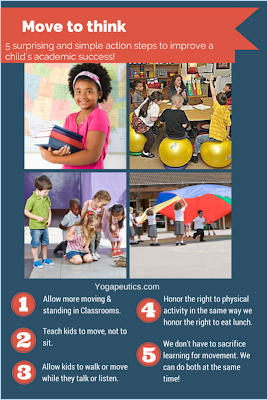 Perhaps the most significant finding this study produced is one that might encourage parents to increase movement opportunities at home as well as influence legislators and schools to increase physical activity in the learning environment. This golden nugget of a finding demonstrates that increasing physical activity can actually improve a child’s academic performance by increasing attention and executive skills. The more the kids in this study participated in physical activity each day and over time, the greater their scores for improving attention, problem solving and decision making. A new strategy for improving our kids’ academic outcomes may be counter-intuitive, but it’s one kids will like, for sure: to decrease sitting at desks and increase movement and physical activity! 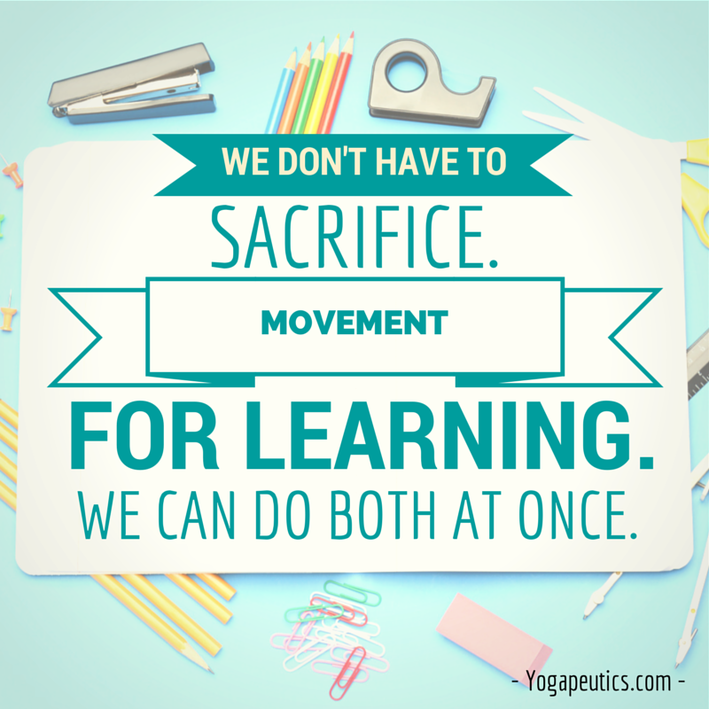 We need to move for better thinking, and that movement can’t just be with our eyes, our mouths and our fingers, as much of today’s education encourages. Unfortunately, our brains are not designed to sustain the small-motor lifestyle we've built for kids. Oral motor (mouth movement through communication). Fine motor (finger movement through writing, keyboarding or utilizing touch technology). 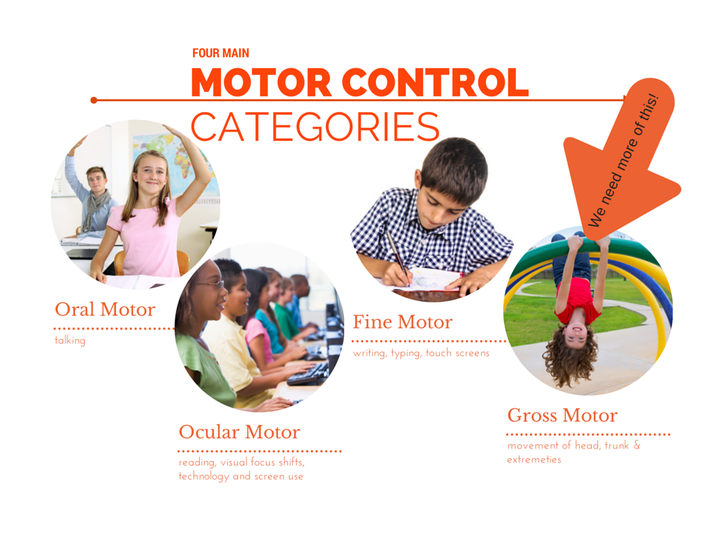 Visual motor (eye movement utilized in reading/writing/math, visual focus shifts from the board to desk, and visual spatial activities with technology). Think of each of these four motor categories as if they were traffic lanes on a four-lane highway in a city. If you restrict or close off one of the lanes during rush hour, the other three 3 lanes are instantly affected and aren't as efficient. Asking a child to sit still while they do school work is like blocking off a traffic lane of information to the brain during the 5 pm traffic surge. It still allows the flow of information, but not as efficiently or effectively. Simply stand up, bend over, and touch your toes 1-2 times. Sit back down to resume class work. Repeat every 15-20 minutes. Take “brain breaks” like Austin ISD teacher, Katie Meyers, does with her 2nd grade students. In Meyer’s classroom, each child has their own designated picture of a brain along the aisles and edges of the room. Throughout the day, when Katie notices the kids need a boost in attention , she will call a “brain break” where kids move to their designated spot in the room and draw 2-3 physical activities from a can of popsicle sticks with various movements written on them (such as five jumping jacks). They complete the task in minutes and return to work. Ms. Meyers reports the kids have better participation and focus with brain breaks, and she doesn’t dare go a day without utilizing them both for her sanity and theirs. Allow kids to stand at a chest-height writing desk with a footrest underneath and the opportunity to rest on a stool when needed. Give kids an option to sit on an exercise ball while doing work at a seated desk instead of sitting in a traditional school chair. Offer kids a floor space to lie on their bellies propped on elbows to complete some work. Assign a classroom job to kids as often as possible. 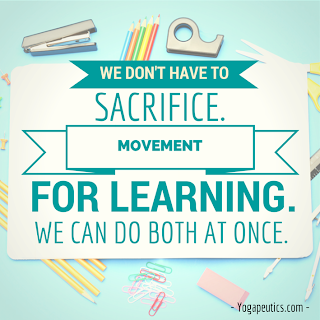 Not only does such a task help the entire classroom community and teaches responsibility, it also supports the child completing the job because a task such as passing out papers to classmates, wiping off tables, or even just cleaning a dry erase board, requires big arm or leg movements and shifting the position of the head in space—all gross motor movements, which assist with attention and learning. Sitting is detrimental to our health and brain function. Modern health experts refer to sitting as “the new smoking” due to the heaps of research that demonstrates how sitting negatively affects our overall health and cognitive abilities. If sitting really is the new smoking, then what does that say about the way we traditionally teach our kids to sit for the majority of the school day? 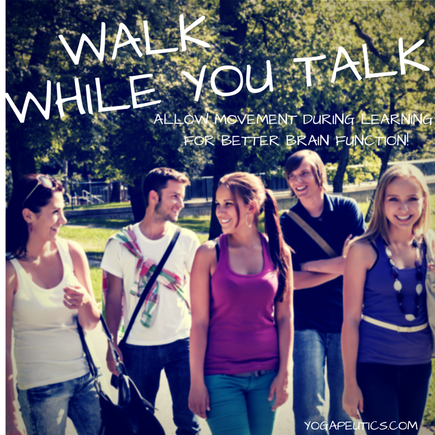 I encourage everyone to see movement and physical activity for what they really are: tools to be integrated into the educational environment and boons to the learning process, not distractions from it. ** inspired by Sir Ken Robinson’s TED talk story about world renowned dancer and choreographer, Gillian Lynne and how as a child she needed to "move to think."